As a Christian, I am embarrassed and angered by the "lying for Jesus," as offended unbelievers call it, by the anti-evolution movement. This page covers Walter Brown's public dishonesty concerning the Grand Canyon. If the Colorado River carved the Grand Canyon, the first question we should ask is "where did all the eroded sediments go?" There should be a very large river delta at the end of the Colorado River. It's not there. If you can't see the video here on this page, see it on Youtube. Is the claim true? Is there no "very large" delta at the end of the Colorado River? Until the early 20th century the Colorado River ran free from its headwaters in the Rocky Mountains of Colorado southwest into Mexico, where it flowed into the Gulf of California. Significant quantities of nourishing silt from throughout the Colorado River Basin were carried downstream, creating the vast Colorado River Delta. Since Wikipedia can vary widely in its reliability, let me give you a better source. NASA provides a description of the former Colorado River delta (accessed 11/13/2013), along with a map. They explain that the Colorado River, due to damming and farm usage, no longer reaches its former delta, but stops at the Sierra de Juarez mountains. Only 10% of the river's water makes it to the current delta. None of it makes it to the delta it reached a century ago. Almost none of the sediment makes it even to the current delta because it's caught by the Hoover Dam. Here is the photo of the region that NASA provides, which includes in the bottom right hand corner a portion of the old river delta. 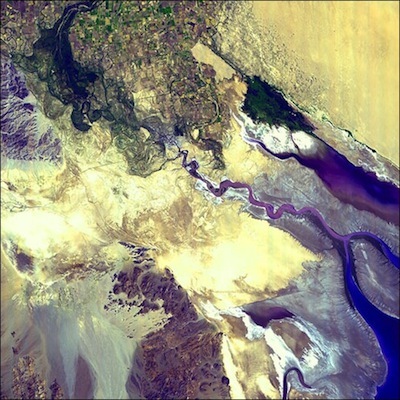 This post is part of a series on the Colorado River Delta. Once teeming with life and spanning some two million acres, the delta of the Colorado River ranked among the planet’s greatest desert deltas. The Colorado River Delta once boasted a million acres of lush cattail marshes and riverside forests of cottonwoods and willows. But today, due to dams and diversions upstream, the river rarely flows through its delta anymore. So Doctor Walter Brown, who has a Ph. D. in mechanical engineering from MIT, one of the most prestigious universities in the United States, was unable to do the research to find out that the Colorado River delta "ranked among the planet's greatest desert deltas"? He was unable to determine that it once provided a million acres of marshes and forests and two million acres of water and sediment? No, anyone with an engineering doctorate from MIT could have done that research better than I could have. This is one more example of lying for Jesus. Readers, you can get as angry at me as you want for saying such things, but liars for Jesus are not helping the cause of God's kingdom, and we have to stand up and declare that this is not the Gospel nor the Christianity that we know. This sort of behavior destroys our testimony and causes the our Savior to be blasphemed among the nations. Our Master and Lord, Jesus the King, is the Truth incarnate. He does not lie, and those who do are not his servants.